What is the nature of the universe and what is it made of? What are matter, energy, space and time? How did we get here and where are we going? Throughout human history, scientific theories and experiments of increasing power and sophistication have addressed these basic questions about the universe. The resulting knowledge has led to revolutionary insights into the nature of the world around us. In the last 30 years, physicists have achieved a profound understanding of the fundamental particles and the physical laws that govern matter, energy, space and time. Researchers have subjected this 'Standard Model' to countless experimental tests; and, again and again, its predictions have held true. The series of experimental and theoretical breakthroughs that combined to produce the Standard Model can truly be celebrated as one of the great scientific triumphs of the 20th century. Now, in a development that some have compared to Copernicus's recognition that the earth is not the center of the solar system, startling new data have revealed that only five percent of the universe is made of normal, visible matter described by the Standard Model. 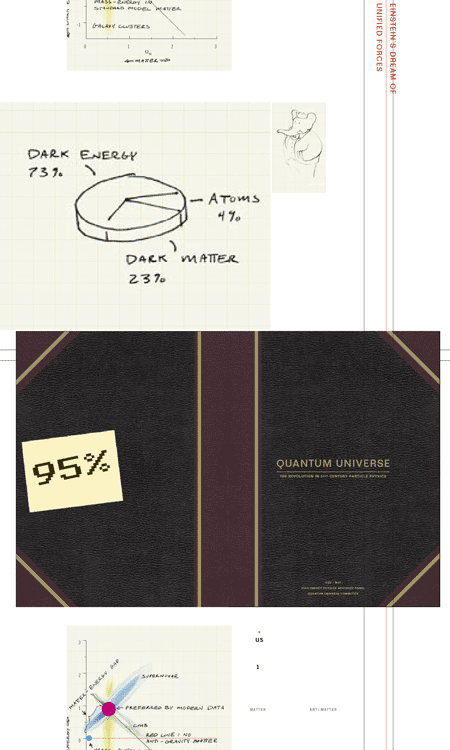 Ninety-five percent of the universe consists of dark matter and dark energy whose fundamental nature is a mystery. The Standard Model's orderly and elegant view of the universe must be incorporated into a deeper theory that can explain the new phenomena. The result will be a revolution in particle physics as dramatic as any that have come before. Nine interrelated questions define the path ahead. 1. Are there undiscovered principles of nature: new symmetries, new physical laws? 2. How can we solve the mystery of dark energy? 3. Are there extra dimensions of space? 4. Do all forces become one? 5. Why are there so many kinds of particles? 6. What is dark matter? How can we make it in the laboratory? 7. What are neutrinos telling us? 8. How did the universe come to be? 9. What happened to the antimatter? >from *Quantum Universe: The Revolution in 21st-Century Physics*. A report by an ad-hoc committee of the HEPAP (High Energy Physics Advisory Panel), charged by the US Department of Energy and the National Science Foundation. Published by Interactions.org, a central resource for communicators of particle physics. The Interactions.org web site was developed and is jointly maintained by the InterAction collaboration, whose members represent the world's particle physics laboratories in Europe, North America and Asia, with funding provided by science funding agencies of many nations.